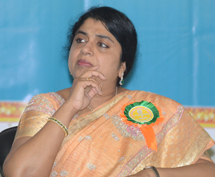 Mrs. Sailaja Kiron has attended as chief guest on 8th March, 2019 at 2 events at Hotel Minerva Secunderabad | Kalanjali | Mrs. Sailaja Kiron has attended as chief guest on 8th March, 2019 at 2 events at Hotel Minerva Secunderabad on the occasion of International women's Day. 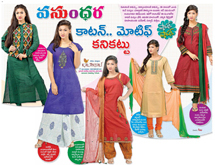 @kalanjali#Women's Day Special. 5th International conference on stress mangament |5th International conference on stress mangament| Kalanjali | MD Sailaja Kiron has attended 5th international conference on stress mangament (ICSM) 2018, Hyderabad on 10th November, 2018 at Hotel Manohar, Begumpet, as chief guest. She was awarded "PVERK PRASAD MEMORIAL AWARD FOR 2018-19" by them. Sunderban | Sunderban| Kalanjali | The Sunderbans brings you hand-block prints and Kalamkari in earthy tones for the perfect casual-ethnic statement. Print Whisper Sarees| Print Whisper Sarees| Kalanjali | The delicate touch of the finest fabrics meets the bold statement of our striking prints. 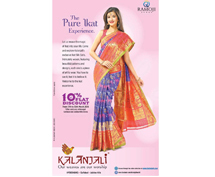 Introducing the Print Whispers collection - beautiful wardrobe essentials from Kalanjali. Ajrak Collection | Mid length kurti | Ajrak Collection | kalanjali Ajrakh as per the local printers means ‘keep it today’. Interpreting it as ‘being intrend’ , we created this beautiful collection where the shapes and motifs echothe architectural forms of Islamicarchitecture’s intricate jali windows and trefoil arches.The earthy tones and the trendy silhouettes are craftedexclusively for you, the ones whow never want to miss out onlooking trendy, fashionable and chic.With this collection we wish you a happy, trendy self cause we know you’ll wearit well! Ajrak Collection | 2 Piece Set | Ajrak Collection | kalanjali Ajrakh as per the local printers means ‘keep it today’. Interpreting it as ‘being intrend’ , we created this beautiful collection where the shapes and motifs echothe architectural forms of Islamicarchitecture’s intricate jali windows and trefoil arches.The earthy tones and the trendy silhouettes are craftedexclusively for you, the ones whow never want to miss out onlooking trendy, fashionable and chic.With this collection we wish you a happy, trendy self cause we know you’ll wearit well! Ajrak Collection | Mid length | Ajrak Collection | kalanjali Ajrakh as per the local printers means ‘keep it today’. Interpreting it as ‘being intrend’ , we created this beautiful collection where the shapes and motifs echothe architectural forms of Islamicarchitecture’s intricate jali windows and trefoil arches.The earthy tones and the trendy silhouettes are craftedexclusively for you, the ones whow never want to miss out onlooking trendy, fashionable and chic.With this collection we wish you a happy, trendy self cause we know you’ll wearit well! Ajrak Collection | Printed dress | Ajrak Collection | KalanjaliAjrakh as per the local printers means ‘keep it today’. Interpreting it as ‘being intrend’ , we created this beautiful collection where the shapes and motifs echothe architectural forms of Islamicarchitecture’s intricate jali windows and trefoil arches.The earthy tones and the trendy silhouettes are craftedexclusively for you, the ones whow never want to miss out onlooking trendy, fashionable and chic.With this collection we wish you a happy, trendy self cause we know you’ll wearit well! Ajrak Collection | Long Kurti | Ajrak Collection | KalanjaliAjrakh as per the local printers means ‘keep it today’. Interpreting it as ‘being intrend’ , we created this beautiful collection where the shapes and motifs echothe architectural forms of Islamicarchitecture’s intricate jali windows and trefoil arches.The earthy tones and the trendy silhouettes are craftedexclusively for you, the ones whow never want to miss out onlooking trendy, fashionable and chic.With this collection we wish you a happy, trendy self cause we know you’ll wearit well! Warli Collection | Mid length kurti | Warli Collection | Kalanjali | KalanjaliInspired from the warli art motifs from Maharashtra, this seasonKalanjali presents a collection designed with hand block printedwarli motifs on various kind of fabrics which are styled in basicshort and long length kurtis. The collection includes range ofgarment suitable for your casual day outing which are comfortable and elegant. Warli Collection | Mangalgiri cotton kurti | Warli Collection | KalanjaliInspired from the warli art motifs from Maharashtra, this seasonKalanjali presents a collection designed with hand block printedwarli motifs on various kind of fabrics which are styled in basicshort and long length kurtis. The collection includes range ofgarment suitable for your casual day outing which are comfortable and elegant. Warli Collection | Long kurti | Warli Collection | kalanjaliInspired from the warli art motifs from Maharashtra, this seasonKalanjali presents a collection designed with hand block printedwarli motifs on various kind of fabrics which are styled in basicshort and long length kurtis. The collection includes range ofgarment suitable for your casual day outing which are comfortable and elegant. Warli Collection | Indo western kurti | Warli Collection | kalanjaliInspired from the warli art motifs from Maharashtra, this seasonKalanjali presents a collection designed with hand block printedwarli motifs on various kind of fabrics which are styled in basicshort and long length kurtis. The collection includes range ofgarment suitable for your casual day outing which are comfortable and elegant. Jharokha Collection | Mens kurta | Jharokha Collection | KalanjaliKalanjali’s new collection is inspired from the Jharokha’s (hangingbalconies) of the old architectures in Rajasthan. The collectionconsists of block printed and embroidered designs which are highly influenced by the Rajasthan architectural designs. The entire range is a combination of ethnic and contemporary silhouettes made of mangalgiri cotton, sico and chanderi fabrics. Jharokha Collection | Long kurti | Jharokha Collection | KalanjaliKalanjali’s new collection is inspired from the Jharokha’s (hangingbalconies) of the old architectures in Rajasthan. The collectionconsists of block printed and embroidered designs which are highly influenced by the Rajasthan architectural designs. The entire range is a combination of ethnic and contemporary silhouettes made of mangalgiri cotton, sico and chanderi fabrics. Jharokha Collection | Lehenga Set | Jharokha Collection | KalanjaliKalanjali’s new collection is inspired from the Jharokha’s (hangingbalconies) of the old architectures in Rajasthan. The collectionconsists of block printed and embroidered designs which are highly influenced by the Rajasthan architectural designs. The entire range is a combination of ethnic and contemporary silhouettes made of mangalgiri cotton, sico and chanderi fabrics. Ajrak Collection | Skirt & Blouse AjrakMade from beautiful block-printed fabric for guaranteed comfort. Style with your favorite accessories for a chic yet casual summer look. Ajrak Collection | Long KurtiThe perfect evening-wear outfit with a beautiful ajrakh print patch on the front panel and accents on the neck and sleeve. Ajrak Collection | Long KurtiTraditional checkered cotton fabric in a contemporary silhouette patched with a stunning ajrakh fabric and a playful potli button placket detail. Ajrak Collection | Long KurtiMade with hand-printed pure cotton fabric with stylish inverted box pleat details exudes a summer charm. Pair it with palazzos to complement the volume of the kurta. Ajrak Collection | 2 Piece set Go traditional this summer with this all-over ajrakh print with a contrast pin-tucked yoke, coupled with a bold, geometric print palazzo. Managing Director of Margadarsi Chit Fund PVT Ltd Inauguration of plantation drive by Smt.Ch. Sailaja Kiron Managing Director of Margadarsi Chit Fund PVT Ltd.
Our Executive Director Mrs.Sailaja Kiron’s interview about Kalanjali’s Great journey of two decades. Rosewood Mandhir Good range of exclusive Mandirs carved out of Rosewood. 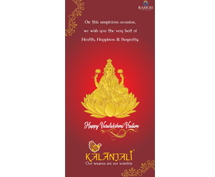 From smallest mandirs to huge mandirs and pooja room sets avialable at Kalanjali, Hyderabad. 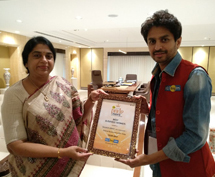 "MD Sailaja Kiron has attended 5th international conference on stress mangament (ICSM) 2018""
MD Sailaja Kiron has attended 5th international conference on stress mangament (ICSM) 2018, Hyderabad on 10th November, 2018 at Hotel Manohar, Begumpet, as chief guest. She was awarded "PVERK PRASAD MEMORIAL AWARD FOR 2018-19" by them. 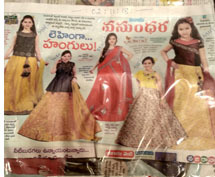 "Kalanjali bring Kanjivaram silk sarees in fold, silver combination variety""
"Kalanali bring this Diwali incredible range of kid's clothing""
"The Director of Kalanjali addressed the Bloggers meet Organized for the launch of the Festive Collections""
On 6th October 2018 Saturday evening 6 PM The Director of Kalanjali addressed the Bloggers meet Organized for the launch of the Festive Collections. Exclusively designed by the brand. The Kalamkari Sunderbans, Gulal & Nizam Collections were showcased to the bloggers. 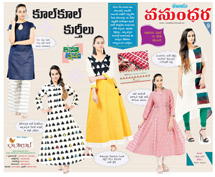 ..
"Kalanjali presents " Nizam collection""
"Kurti has become a very integral outfit." Kalanjali bring latest casual wearing beautiful hand loom cotton kurtis in camel and Ikat collection..
Kalanjali Brings Jharokha Collection .Textured fabric with mosaic print all over the kurti and Chinese collar with buttons in the front which makes perfect outfit for casual wear. Chanderi top with yoke and sleeves in Ikat design print. Elegant occasion wear kurti, part of our basic collection. 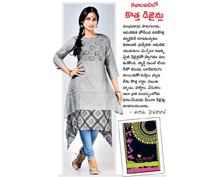 "The winner of "Swarna Santosham Kalanjali"
Kalanjali Swarna Santosham lucky draw winner P.Sowjanya, Vizag. Coupon number: 31018289, Receiving one gram gold coin at Vizag branch on 29 Aug 2018. 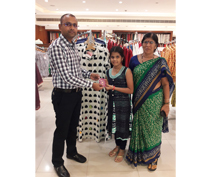 Kalanjali Swarna Santosham lucky draw winner Madhuri, Vizag. Coupon number: 31018237, Receiving one gram gold coin at Vizag branch on 28 Aug 2018. Kalanjali Swarna Santosham lucky draw winner Ch.Suvarchala, Vizag. 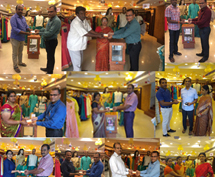 Coupon number: 31018211, Receiving one gram gold coin at Vizag branch on 27 Aug 2018. 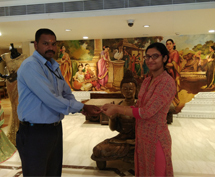 Kalanjali Swarna Santosham lucky draw winner MS Jairam. 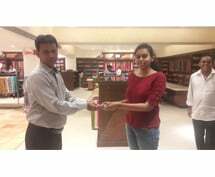 Coupon number: 31046225, Receiving one gram gold coin at the saifabad branch on 27 Aug 2018. Kalanjali Brings Jharokha Collection .Sico lehanga set for girls with mosaic block printed all over highlighted with embroidery. It has a tissue dupatta with beautiful tassels. 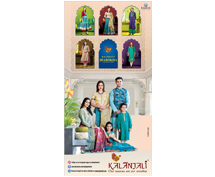 "Kalanjali charming digital fragonard printed tussar long kurti collection comes in!" Kalanjali charming digital fragonard printed tussar long kurti collection comes in!Add class to your wardrobe with this affordable unframed digital fragonard printed tussar long kurti, contrast pallazo adds to the trendy perfection. 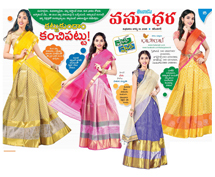 We are pleased to inform you the winner of "Swarna Santosham Kalanjali" Telangana & Andhra showrooms(Tirupathi Branch) .Why wait, grab the opportunity before its too late! "Kalanjali bring our heritage culture to our couture this festive season"
Kalanjali bring our heritage culture to our couture this festive season. Adorn this unique traditional Arni pattu saree, which enhance your beauty. 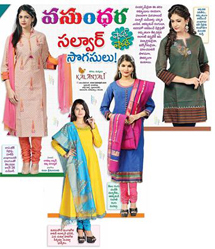 We are pleased to inform you the winner of "Swarna Santosham Kalanjali" Telangana showrooms is Ms.Divya, Uppal, Hyderabad., coupon bearing no: 31045003 .Why wait, grab the opportunity before its too late! 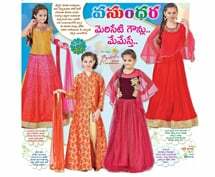 We are pleased to inform you the winner of "Swarna Santosham Kalanjali" Telangana showrooms is Mr.Ashok Kumar .P, Hayat Nagar,Hyderabad., coupon bearing no: 31044200 .Why wait, grab the opportunity before its too late! 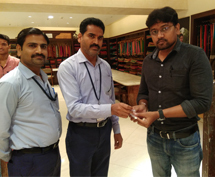 We are pleased to inform you the winner of "Swarna Santosham Kalanjali" Telangana showrooms is Mr. Harikrishna B.N-Ashok Nagar, coupon bearing no: 331044063 .Why wait, grab the opportunity before its too late! 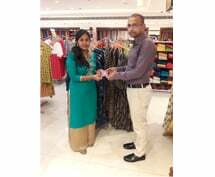 We are pleased to inform you the winner of "Swarna Santosham Kalanjali" Telangana showrooms is Ms.Anuja Sharma Patiala, Punjab Commissioner of Income Tax, coupon bearing no: 31043766 .Why wait, grab the opportunity before its too late! "Asymmetrical over lay style tail cut stylish kurti"
"A unique ethnic kanchipattu brocade pavada shine in style"
"Kalanjali bring Angrakha style "
"Mangalgiri hand loom cotton boys vasant kurtis"
" Alluring designer Anarkali suits in resham, gold phulkari embroidery work and digital print"
" Kalanjali present vintage floral prints, linen saree collection "
" Kalanjali aim to keep up with the trends by updating collections with the latest styles every single day"
" Smt.Sailaja Kiron addressing the 25TH NHRAI HR MEET"
Managing Director of Margadarsi Chit Fund PVT LTD Smt.Sailaja Kiron addressing the 25TH NHRAI HR MEET on 7th July, 2018, she was Invited as a Chief Guest..
" Smt.Sailaja Kiron addressing the 30th Installation Ceremony of Rotary Club Jubilee hills"
Managing Director of Margadarsi Chit Fund PVT LTD Smt.Sailaja Kiron addressing the 30th Installation Ceremony of Rotary Club Jubilee hills on 3rd July 2018, she was Invited as a Chief Guest..
" Kalanjali bring latest collection of Bhagulpur, Mangalgiri cotton kurtis"
" Kalanjali bring a wide range of Ethnic wear Banarasi silk sarees in gorgeous color combination"
"Prathibha Puraskara Award being presented to Smt.Ch.Sailaja Kiron "
"Kalanjali bring you the most captivating and dazzling fairly tale gowns "
"Kalanjali experimenting with fashion every day by adding some contemporary and urban touch to the traditional and classic Kanchivaram silk saree..."
"Pure Zari Kota saree intricately jamdhani woven in meena/floral design." 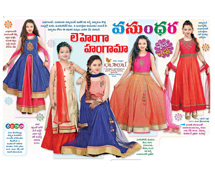 "Kalanjali bring kanchivaram silk pavadas for your youngsters"
"Kalanjali bring Kid's ethnic party wear Gown, Anarkali suits and Ghagra for every occasion." "Kalanjali bring Georgette, Chiffon saree collections "
"Lustre of linen hand loom silk saree"
Lustre of linen hand loom silk saree, Land the lustre of silk with out the slighted discomfort this summer as kalanjali present classic linen silk sarees with shine of silk and comfort of linen in blossom and pastel colors..
"NIPUN IKAT – Wear the art of skillfulness"
Kalanjali’s new summer collection celebrates the skilled craftsmanship of the Pochampally Ikat weavers. Pochampally Ikat is the first product from India’s traditional craft sector to be awarded a Geographical Indication (GI) status. The Nipun Ikat collection presents you with bold bright colored woven patterns that are abstract, modernist and geometric.The entire range brings to you contemporary, easy and comfortable cuts in cotton, mercerized cotton and sico Ikat fabrics which are accentuated with light embroidery details and thus offering uniqueness to every style. You can choose from the wide range of styles and own the perfect piece for you. Flaunt the decorated handloom textile in style this season! 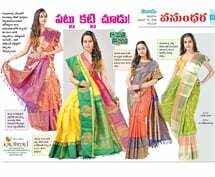 "Kalanjali bring Paithani hand woven silk sarees"
Paithani is a variety of saree, named after the paithani town in Aurangabad, Maharashtra state, where they are woven by hand, made from very fine silk. It is considered as one the richest saree in India" This saree is the best choice for Festive wear, formal occasions as well as celebrations like get together, social parties corporate bashes and other events! "Kalanjali presenting fashion trends.... "
It is the ultimate destination for dazzling designer kora silk anarkali suits, intricately antique and resham kasab embroidery work and enhanced with gold / silver floral digital print..
"Kalanjali bring pure Ikat Collection... "
The Pure Ikat Experience. Let us weave the magic of Ikat into your life. Come and explore Kalanjali’s exclusive Ikat Silk Saris. Intricately woven, featuring beautiful patterns and designs, each one is a piece of art to wear. You have to see it, feel it to believe it. Welcome to the Ikat experience. 10% FLAT DISCOUNT From 17th to 30th March 2018 *Offer valid only at kalanjali Saifabad and Jubilee Hills Stores..
"NIPUN IKAT – Wear the art of skillfulness... "
Kalanjali’s new summer collection celebrates the skilled craftsmanship of the Pochampally Ikat weavers. Pochampally Ikat is the first product from India’s traditional craft sector to be awarded a Geographical Indication (GI) status. The Nipun Ikat collection presents you with bold bright colored woven patterns that are abstract, modernist and geometric. The entire range brings to you contemporary, easy and comfortable cuts in cotton, mercerized cotton and sico Ikat fabrics which are accentuated with light embroidery details and thus offering uniqueness to every style. You can choose from the wide range of styles and own the perfect piece for you. Flaunt the decorated handloom textile in style this season! ..
"Kalanjali bring Kids Collection... "
Stylish designer kid's couture for formal party and special occasions..
"Kalanjali bring vibrant bust of colors, stunning and unique kanchivaram silk sarees... "
"Gorgeous dhakai designs and varanasi zari woven kora sarees, available in multiple colors "
Kora silk comes from Varanasi it is popular for it smooth and sheer texture which is much dull in comparison to other silk.These saree are the best choice for Festive wear and can be worn all casual event! 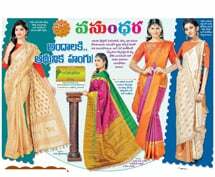 "fashion Arni and Kanjivaram silk sarees"
Handloom Arni/Kanjivaram silk saree is famous for its design which is made of mulberry silk thread zari and ye.These sarees are available in a variety of design. 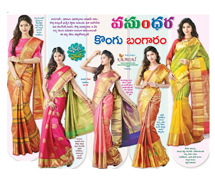 Kanjivaram saree is becoming one of the most popular ethnic Indian attire across the globe. 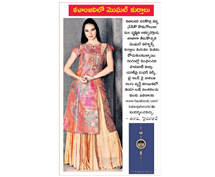 "Kanjivaram silk pavada are very unique dress from South India." Vibrantly gorgeous pavada for a wedding party wear. A fine statement ethnic touch is furnished by beautiful woven and dupatta create a delightful traditional charm.
" 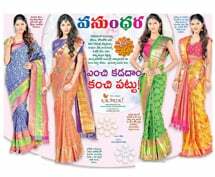 Kalanjali bring Kanjivaram banarasi sarees..."
" Look resplendent in kanchipattu saree by Jubilee Hills Kalanjali..."
"The winner's of "Maa Bangaru Kalanjali"
We are glad to inform the last winners of “Maa Bangaru Kalanjali” of Telangana showrooms is Ms. Parul Varma of New Delhi. 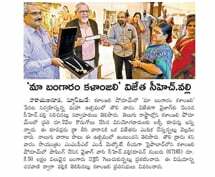 As destiny chooses the Lucky person, she came to Hyderabad for a conference and as # KALANJALI is a # tourist_ destination too, she came to KALANJALI for shopping and ended up winning the Gold Necklace. 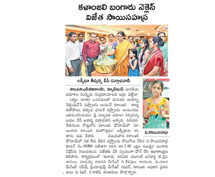 Mrs. Suma was the special guest who picked the lucky winner at Jubilee Hills showroom out of 1000’s coupons. 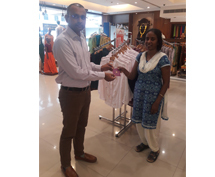 The winner of Andhra showrooms is Ms. Neha of Vizag Mrs. Sujatha was the special guest who picked the lucky winner at our Vijayawada showroom out of 1000’s of coupons. 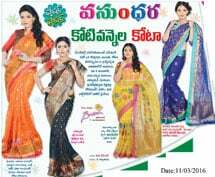 "The winner of "Maa Bangaru Kalanjali"
We are pleased to inform you the winner of "Maa Bangaru Kalanjali" Andhra Pradesh showrooms is V.Sai Sahasra, coupon bearing no: 00300. Why wait, Two more Gold Necklaces to be won, grab the opportunity before its too late! We are pleased to inform you the winner of "Maa Bangaru Kalanjali" Telangana showrooms is Ms.Ms.Shoba Chennubotla, coupon bearing no: 020999 .Why wait, Two more Gold Necklaces to be won, grab the opportunity before its too late! 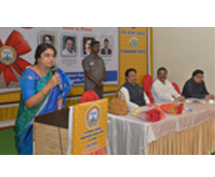 "Mrs.Sailaja Kiron inaugurating the “CA students conference”"
Mrs.Sailaja Kiron inaugurating the “CA students conference” at #Institute_of_Charted_Accountants_of_India, Hyderabad.She expressed that youth should contribute to Nation building by actively participating in social causes. 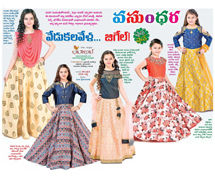 "Kalanjali bring latest kid's garments collection"
Your little princess deserves only the best so dress them in beautifully, alluring designed garments from Kalanjali...The best of kid's for all age groups! We are pleased to inform you the winner of "Maa Bangaru Kalanjali" Andhra Pradesh showrooms is Mr. Sudheer, coupon bearing no: 002085. Why wait, Four more Gold Necklaces to be won, grab the opportunity before its too late! We are pleased to inform you the winner of "Maa Bangaru Kalanjali" Telangana showrooms is Ms.Arundhati Reddy of Hyderabad, coupon bearing no: 012507.Why wait, Four more Gold Necklaces to be won, grab the opportunity before its too late! 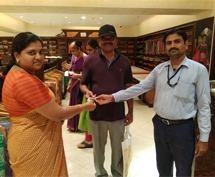 We are pleased to inform you the winner of "Maa Bangaru Kalanjali" Andhra Pradesh showrooms is Ms. Padmatej Jayashankar of Tirupathi, coupon bearing no: 005091. Why wait, Six more Gold Necklaces to be won, grab the opportunity before its too late! We are pleased to inform you the winner of "Maa Bangaru Kalanjali" Telangana showrooms is Ms.Ch.Valli of Vizag, coupon bearing no: 017185.Why wait, Six more Gold Necklaces to be won, grab the opportunity before its too late! 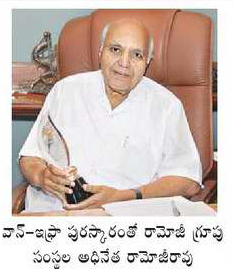 "Best Business Women Award presented by 92.7 big FM." 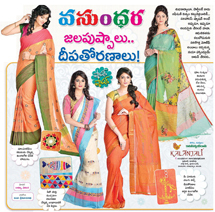 "Kalanjali bring chic style, latest kid's garments collection for Christmas.."
"Kalanjali bring Kuppadam fancy silk sarees..."
"Kalanjali bring latest gorgeous handloom Ikat silk saree..."
"Kalanjali bring in this fresh Autumn season Glossy, adorable, stunning Banarasi sarees"
"Kalanjali bring you the most captivating and dazzling collection"
"Kalanjali bring fusion of traditional and contemporary antique designs in Banarasi Bailu sarees"
Stylised designer made exquisite Salwar set and kurtis with Bull motif from our Vrishabha Collection, which enhances your personality. Pair them with leggings or a pair of jeans. 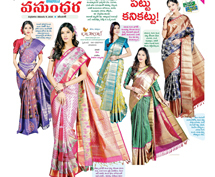 "Epitome of grace,beauty and sophistication"
"Ravishing designer pattu sarees from Vizag Kalanjali.."
saree features majestic elephants and alluring peacocks chevron and floral making these sarees even more desirable. "A Fusion of understated Ikat and Kanchivaram charm,Ethnic extraordinaire in pochampally Ikat sarees"
Ikat is an Indonesian term meaning "of bind" or knot". A fusion of understated Ikat and kanchivaram charm, lepakshi design and kanchivaram traditional is the modern adoption of classic saree...A red design on a Navy blue ground with rows of flowers and mango motifs in the border.The simple meena leaf design repeated across the border andkadhi gold/kanchivaram traditional charm in the border created mesmerizing contemporary effect..
"Kalanjali bring you this Ashadam season with true elegance Simple hand woven sico and silk saree in vibrant colors with gorgeous designs...."
Sico is the combination of shimmy silk and soothing cotton fabrics.Sico sarees have nice durability texture and drape well.Sico saree are cheaper when can pared to pure silk saree and very easy to manage. "Traditional ensemble style generouslyFlawless beautiful Banarasi kathan silk sarees for Ramzan from Kalanjali..."
Easy pick as your office wear. 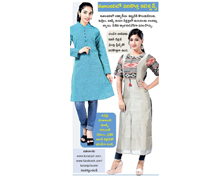 Comfortable and elegant Mangalgiri cotton kurtis with little embroidery on the yoke and the sleeves hem. 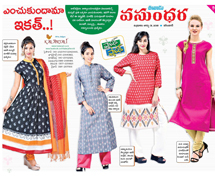 Pochampally cotton salwar suits and woven kurtis with a modern touch with fine embroidery and mirror work. Cotton a fabric which makes you look elegant and makes you feel comfortable too. 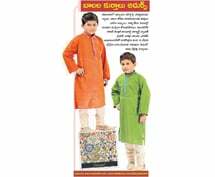 Get these Pochampally Cotton outfits and be the centre of attraction. Beautiful addition to our Shadows of summer collection are these Off-white sico sarees with with sunny and happy colours with eye comforting floral and geometrical motifs block printed all over the saree. Eye cathcing shades of saree and the bull motifs hand block printed sarees for you which adds to elegance and boldness to your personality. Addition to our Petite Blossoms collection, we present the block printed Tussar and silk cotton sarees with the floral and bird motifs. The fine embroidery on the sarees highlights the motifs and adds to the beauty and grace to it. This samrtly designed churidar kurta is sure to brighten-up your ehtnic wardrobe.This blue kurta with traditional woven borders, embroidered detail, has a v-shped neck with a mock-overlap look ,three-quarter sleeves, sea green extended piping with beautiful tassel tie up. Contrast embroidered detail throughout on the front panel in paithani motifs in combination of mirror work speaks for itself.Along with it comes a woven sea green bottom with dyed dupatta and tasseled hems.
" Lustre of Linen, the comfort of kadhi, enjoy the opulence of silk with the new collection of classic linen/kadhi silk sarees brought to you by Kalanjali"
Bright and vibrant hues and breezy fabric summarizes the essence of the collection Shadows of Summer. A variety of cotton with sunny and happy colours with eye comforting motifs. Block printed off white saree with mirror work sure to make you look more graceful in this ethnic handrcrafted tussar saree in any formal occasion. Indigo is a plant derived dye, that is used widely in textiles and fashion garments.We at Kalanjali have attempted to create a collection using this ever loved Dye by using the technique 'Batik" which is a hand done process. Look elegant in these Silk cotton sarees dyed in Indigo..
"Splendid wedding brocade pattu sarees collection from KP Kalanjali.."
"Kalamkari set of Sleeveless kurti with pintucks "
Look the best in this Kalamkari set of Sleeveless kurti with pintucks at yoke and palazzo and also an embroidered pastel green kurti on top. A very comfortable evening wear in this hot summer. "Adding in our Mughal Collection is this Indo-western style Ghagra choli"
Adding in our Mughal Collection is this Indo-western style Ghagra choli. Blouse is a beautifully styled silhouette with zardosi and sequin handwork, paired with a transparent slit skirt with Mughal flowers that's lined with printed chic pants. Be the centre of the party in this elegant ghagra choli. 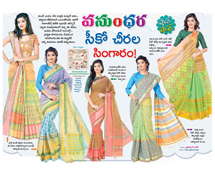 "Kanchipattu new collection Wedding/Party wear sarees in chic style from Vijayawada Kalanjali"
Celebrate your precious moments with kalanjali mulberry silk sarees.Gorgeous pattu sarees with beautiful combination, intricately jacquard/jamdhani hand woven in resham gold with amazing contemporary designs.These sarees are the best choice for many occasions. Perfect summer wear, Origami Bird motif embroidered on the blue/beige cotton crop top. Pair it with palazzo, straight pants or jeans and feel cool in this hot summer. Smart ethnics handcrafted in whites and beiges with handlooms of cotton and tussar, which gives you a feel of purity and peacefulness. "Summer special collection by Kalanjali "
"Adding a contemporary touch to Banarasi kora silk sarees by kalanjali"
"Summer special collection by Jubilee hill Kalanjali Gorgeous pastel colors, delicate Pure zari kota sarees"
Petite Blossoms is a very summery pastel collection, crafted with a lot of love, creating surfaces of birds and blossoms together an interplay of beauty and grace, through prints and embroideries on silk cotton sarees. Mughal Collection is thought on an entirely different perspective with contemporary silhouettes with indo-western feel to it. Adding to the collection is this colourful randomized printed long kurta with a tie and dye orange skirt alongwith slight mirror work on the yoke. Kalanjali presents to you our new collection inspired from the beautiful and intricate Mughal architecture.Sarees with the comfort you are looking for, paired with stylish blouses with intricate detailed embroidery that will just grab everybody's attention! 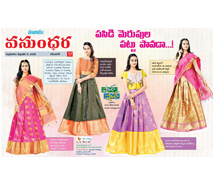 "Kalanjali bring you this Ugadi latest collection"
Collating pattu with kora unique in the colors and pattern, brocade stylish designer gorgeous sarees for wedding and formal party wear. 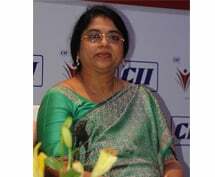 "Mrs. Sailaja kiron at Women's leadership conclave"
"Mrs. Sailaja kiron at Women's leadership conclave held at hotel AVASA hyderabad on 17 march 2017,organised by CII.Other dignitaries in the program are Mrs. Rukmini,Mrs. 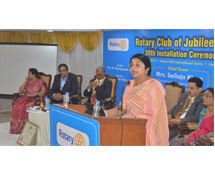 suchitra Ella, Mrs.Tejaswini yarlagadda, Mrs. Vanitha Datla,Mrs. Naga Parameswari, Mrs. Vidhya, Mr. Jayesh Ranjan, Mrs. Shoba Dixit. 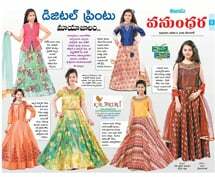 "Kid's special party and festive wear designer garments from kalanjali..."
"Mrs. Sailaja Kiron at Siddhartha institute of technology"
Mrs. Sailaja Kiron at 19th Annual Day celebrations of Siddhartha institute of technology at vijayawada. Origami is the Japanese word for paper folding. 'Ori" means to fold and 'Kami' means paper. Its an art that was passed from parent to child in Japan.We take pleasure in taking this cheerful, childlike art form forward through our collection.This collection consists of mostly pure cottons with bright Origami prints of birds, animals and other motifs, further embellished with beautiful hand-crafted machine embroidery. You will find women's wear, kid's wear and men's wear.We hope this collection delights you as much as we enjoyed creating it.…..
"Wide range of sheer handwoven Mangalgiri cotton sarees with woven borders in dark colour palette"
Wide range of sheer handwoven Mangalgiri cotton sarees with woven borders in dark colour palette. Warli folk art block prints in brighter tones has been well explored all over the saree in contrasting festive tones. Perfect to wear during summers. Grab one for yourself from our stores.…..
Muggam embroidered Bulls and bells on Kanchivaram pattu sarees..A unique collection of sarees with the elegant bulls and bells. And for the party wear the tussar collection half & half sarees with bulls print. 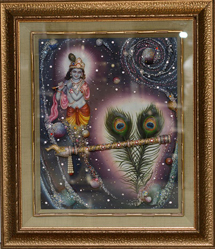 …..
Kalanjali for best of everything in Indian artefacts, this article is about the wide collection of traditional paintings. Apart from the images shown, we have the best of the Patachitras, Palmleaf Paintings, Mughal miniatures, Pahadi Paintings, Baramas themes, WoodInlay Panels, etc…..
"Alluring Silk cotton sarees in beautiful shades"
Beautiful silk cotton sarees in woven and embroidery. The sarees with unique swan motifs woven are sure to enhance your beauty. 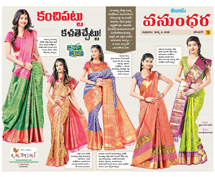 Easy to drape and maintain these sico sarees are must in your wardrobe, for any festive occasion. 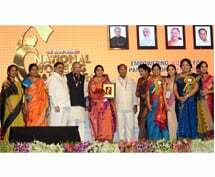 "Our Director Mrs.Sailaja Kiron at the "NATIONAL WOMEN'S PARLIAMENT" along with other dignitaries"
Our Director Mrs.Sailaja Kiron at the "NATIONAL WOMEN'S PARLIAMENT" along with other dignitaries. It's a great initiative, the idea is to empower the women for participatory democracy. We wish grand success to all such endeavours of all like minded people and organisations. Feel the magic of ikat tie and dye craft in these beautiful sarees. The magic of the weaver is clearly evident in these beautiful, simple and smart ikat sarees, brilliantly merging the bright shades of red and blues. The detailed embroidery and mirror work enhances the beauty to sarees. Make these Ikat masterpieces a must have in your wardrobe..
"Beautiful Mangalgiri stylised chudidar set with hand painted kalamkari dupatta"
Beautiful Mangalgiri stylised chudidar set with hand painted kalamkari dupatta for any occasion this summer. Comfortable and yet in trend chudidar set in two colour ways is sure to enhance your beauty. Adding to our new collection of Mughal Collection, we have the Ghagra sets and contemporary silhouettes with indo-western feel to it. The ghagras made for a festive occasion, digitial printed lehegas with contrast shades and minimal embroidery detail on the blouse for . The kurti with digital print in georgete and a stylised rust coloured kurti with slit on one leg for casual wear. "Comfortable Salwar suit with embroidered Kurti"
"Monochrome Collection is this beautiful Lehenga choli"
Fashion’s ongoing love affair with floral prints continues for Spring- summer 2017 with a myriad of designers offering up their take on the iconic pattern. Be prepared to embrace your inner lady with floral print dresses, Kurtis, Tops,Salwar suits and Lehengas. This season’s florals come in soft pastel colours and vibrant hues, all of which are some variation of the garden theme.Florals are all about having fun with fashion and embracing the joy and romance of spring. Perhaps this is why the floral trend is one that just won’t go away.‘Frangonard; is one such tribute to all the floral lovers this season!!!.. "INSPIRED BY THE BEAUTY OF FLORALS, EARTHY HUES AND NATURAL TEXTURES, KALANJALI BRINGS YOU ITS BHOOMI COLLECTION"
"Kalanjali bring in a new season with true elegance pattu sarees"
"Vrishabha Collection, an ode to the boldness and the traditional value of the bulls"
"Kalanjali presents to you our new collection inspired from the beautiful and intricate mughal architecture"
Kalanjali presents to you our new collection inspired from the beautiful and intricate mughal architecture. This collection is thought on an entirely different perspective with contemporary silhouettes with indo-western feel to it. Exploring all the aspects of it, we have a wide variety of styles putting together exciting prints on range of fabrics for you to pick from. "Kalanjali bring in a new season with Vrishabha collection..."
"Mirror Maze is an amazing collection interspersed with a combination of traditional aesthetics and modern flair"
"The best quality Cotton and Sico sarees hand printed, comfortable for any occassion"
"The Blue Gold Collection from the house of Kalanjali is an ode to grace and wonder"
"Brisah bring gorgeous and stylish kid's garment for this Christmas." "Here's an Ikat lehenga in half net and half ikat silk"
For that centre-of-attraction look, here's an Ikat lehenga in half net and half ikat silk. An addition in the Mirror Maze collection, the contemporary lehenga with dazzling emerald green woven silk ikat fabric put together with a peplum top, embroidered with mirrors all over is just the one for an evening of non-stop fun. "Flared Anarkali chudidar set with exquisite dupatta"
Grab this unique chudidar set with a flared Anarkali top with a cotton chudidar and an exquisite printed dupatta. A must in your wardrobe for any festive occasion. 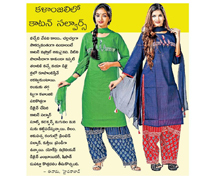 Available only at Hyderabad showrooms. The Blue Gold Collection from the house of Kalanjali is an ode to grace and wonder. The enchanting collection represents unique weaves, patterns and motifs that brilliantly form captivating designs on the finest fabrics. Shop to your heart's content for, what you get here is truly unique and a result of inimitable passion. "Exquisite chudidar sets at Kalanjali"
Vibrant chudidar set in two colour ways, Blue and green , Dupatta in sheer fabric and the embroidery enchances the beauty of the garment. The comfort of cotton and elegance of the sheer fabric dupatta with calligraphy printed on the dupatta and kurti makes it a perfect pick. A comfortable as well as beautiful casual wear. "Inspired by the beauty of florals, earthy hues and natural textures, Kalanjali brings you its Bhoomi Collection." 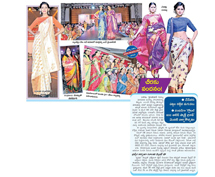 "kalanjali fashion show on the occasion of first anniversary celebrations of The Global 100 Sarees Pact Group"
"Kalanjali bring you unique/magnificent designer gold brocade kachivaram silk sarees"
Magnificent gold brocade kanchivaram silk saree intricate hand woven in fuchsia pinkish floral creeper jaal with horse motifs highlighted all over.The delicious color of this kanchivaram silk saree is a culmination of fuchsia pinkish with multi checks design and many more stunning unique pattu orangza sarees..Kanchi varam saree have always held a special place in a women's heart.This hand woven saree is famous for its design, which is made of mulberry silk thread, zari and dye. 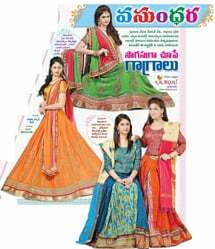 "Kalanjali brings you a breathtaking brand new Mirror Maze Collection"
"The magic of youngster in the Glamours shades"
"Unique in the colors and pattern collating kanchivaram silk saree couture."" "Beautiful embroidered salwar suit and kurti"
"Brisah designer suits are all designed keeping in mind the requirements for Dilwali festival..."
"Kalanjali presents elegant and contemporary chudidar sets..."
"Bring this festive season with true elegance..."
"Kalanjali bring in festive season with true elegance, Vintage pattu brocade saree collection..."
Add colour to your wardrobe this festive season. A magnificently coloured casual and festive ensembles gives life to chanderi fabric as they drape into modern & traditional silhouettes, where grace and timelessness find a home.A Collection inspired by the tradition, made in fresh colour tones of peach, blue, yellows and greens, accented with traditional block and screen prints and richly embellished with hand embroidery is a must for your wardrobe and is perfect for every occasion. Kalanjali presents its collection “MONOCHROME” which captures the essence of Indian style. A magnificently coloured casual and festive ensembles gives life to mangalgiri fabrics as they drape into modern & traditional silhouettes, where grace and timelessness find a home. 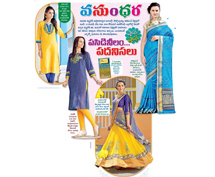 A Collection inspired by the tradition, made in fresh colour tones of peach, blue and greens, accented with traditional block and screen prints and richly embellished with hand embroidery is a must for your wardrobe and is perfect for every occasion. .
Kalanjali presents the trendy Palazzo in Handloom. A two piece palazzo set with long kurti with Lotus motif printed in glitter all over. The neck has contrast piping with dainty floral embroidery, bead work and sequins. price 1600/-..
Kalanjali presents Western wear in Handloom cotton with beautiful elephant motifs.Suitable on pants or jeans Western wear tops in Summer yellow colour, Jaipur block printed elephants motifs on one half of the shirt and the other half body plain, and the other top with a single elephant motif with stick ons, The Apple green mangalgiri cotton top has chinese collar and mangalgiri jacquard front centre and back panel with center front opening, sleeves with peacock motif. ..
“MONOCHROME” collection which captures the essence of Indian style. A magnificently coloured casual and festive ensembles gives life to chanderi and mangalgiri fabrics as they drape into modern & traditional silhouettes, where grace and timelessness find a home.Bright yellow Jaipur block printed mid length Kurti, with elephant motifs, long sleeves, broad placket with opening and fresh green Chanderi long Kurti with side placket near the neck with loops. Embellished with metal stick ons and orange embroidery. A Collection inspired by the tradition, accented with traditional block and richly embellished with hand embroidery is perfect for every occasion. .. 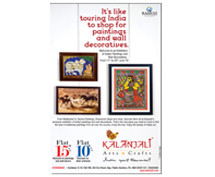 Welcome to an Exhibition of Indian Paintings and Wall Decoratives. 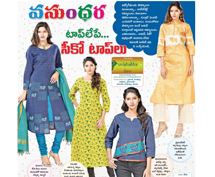 From 11th to 26th June'16 at Kalanjali, opp Public Gardens, Saifabad, Hyderabad. For details please contact: 040-66665308 / 23231147..
"Kalanjali is the epitome of grace" presenting this season the marvelous collection inspired by high magic of conspiring with animal nature and tribal life. 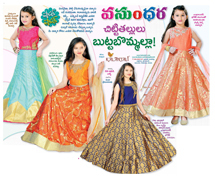 Amazing trendy gowns & chudidar suits and ghagra choli for your little ones... Pastel tones are perfect for this summer, Gown & chudidar suits and ghagra choli enhanced with crystal embroidery work and tissue flare. 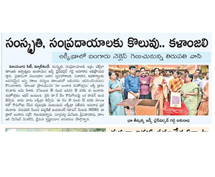 KALANJALI’s Parent Group Company “EENADU” has been conferred with “WAN IFRA” Gold Medal for the great work done by the group for “SWACHH BHARATH ABHIYAN”. Go with the trend...Geometrically designed long flared skirt with a kurta, just what you need for an occasion with a stylish look. 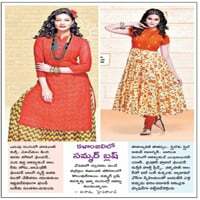 This collection is for the Handloom Lovers. 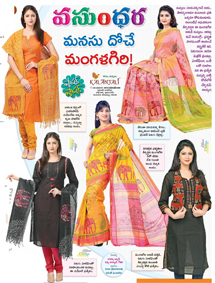 The sarees are in summer friendly fabric- Cotton and Sico with exclusively deisgned block prints and embroidery. For those looking for a change in their wardrobe this is a best buy. 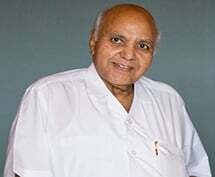 We are glad to inform you that our Chairman, Shri Ramoji Rao has been conferred today with Padmavibhushan along with shri.Rajnikanth and others. 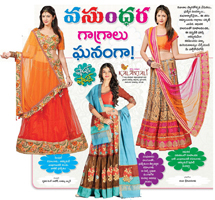 Beautiful sarees for the beautiful you. The green shade kora saree woven with abstract waves design has a glossy tissue border. 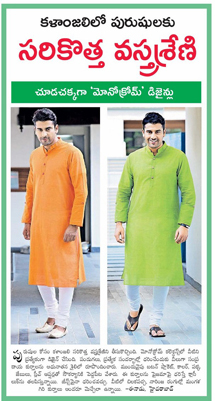 These are the long gown chudidhars which are very stylish and the in thing. Ideal for party's and special days. These are our tempting collection from Brisah,they are ideal summer wear. 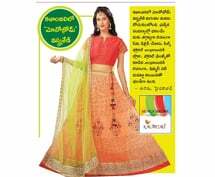 The orange shade is with meena floral border. 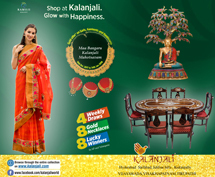 These exclusive collections are developed in house by Kalanjali.